Microsoft's vision of apps that can be written once and will run on a wide variety of devices, is finally a reality with the release of Windows 10. The single, unified Windows core enables one app to run on every Windows device – be it a phone, a tablet, a laptop, a PC, or the Xbox console. And very soon the same apps will also run on the upcoming devices being added to the Windows family, including IoT devices like the Raspberry Pi 2, Microsoft HoloLens and the Surface Hub. In a previous article Build a Windows 10 Universal App – First Look I wrote an introduction about why Windows 10 is different from previous versions of Windows and how you, as a developer, can take advantages of new features in Windows 10 and write better code. In this article, we will start developing a better Music Player app and we will also try to use some of the unique new platform features in Windows 10 to develop a single app which runs on multiple devices. 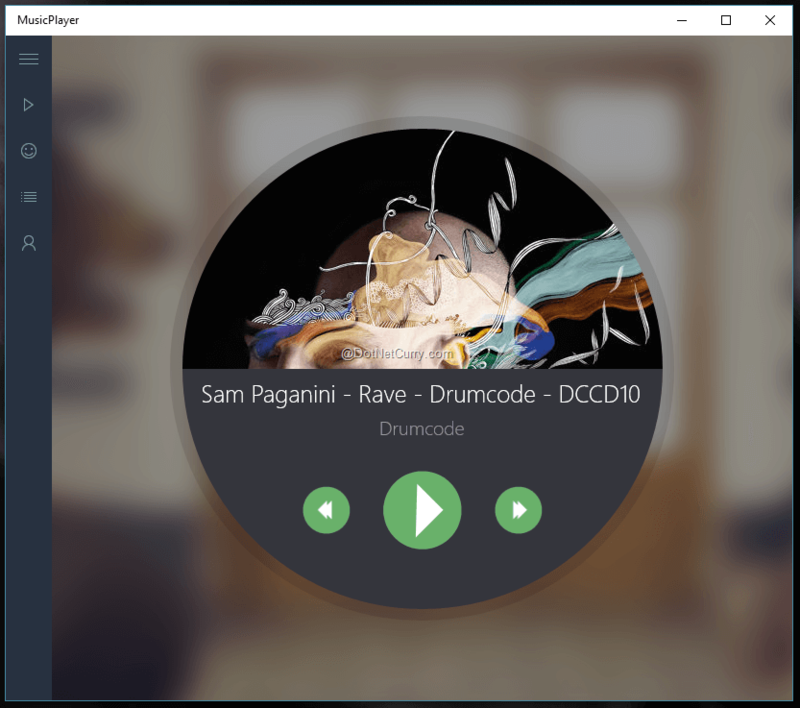 We are going to develop a Music Player in Windows 10 which will use Sound Cloud API to play our Likes, Playlists etc. Here is a screenshot of how the player will look in Desktop, Tablet and Phone. If you do not use Sound Cloud (there is no reason not to use Sound Cloud if you love Music), register for a new account and start Liking tracks and create playlists for your favourite tracks. We will be using these for our App. Register a new Client Application by visiting the Sound Cloud Developer Website (https://developers.soundcloud.com/). Keep a note of the Client Id Value. Fire up Visual Studio 2015 and create a New Blank App (Universal Windows) under Templates > Visual C# > Windows. Right click the new project and click on Manage NuGet Packages. Search for Newtonsoft.json library and install the package. You may also want to add some images that are included with the Source Code of this article. We will be using those to design the App. If you want to learn more about new Controls in Windows 10, I would recommend downloading Developer Samples from GitHub (https://github.com/Microsoft/Windows-universal-samples) and playing around with the sample projects. 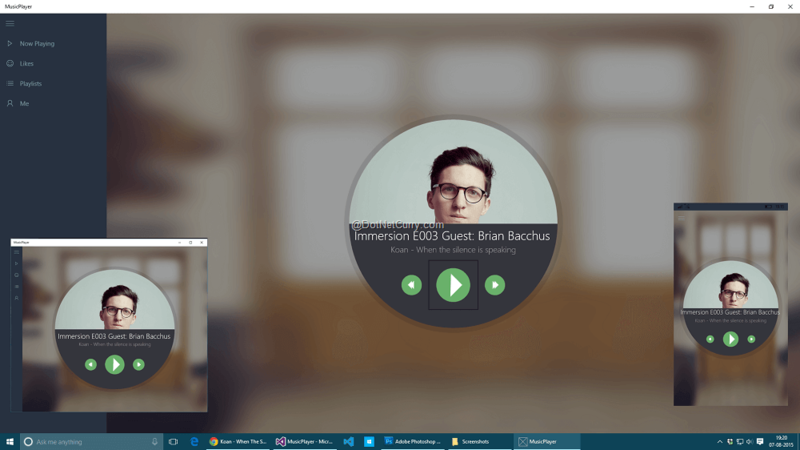 One of the new controls introduced in Windows 10 is the SplitView. It is a very simple but useful control which can be used to build quick Navigation related features in our App. This control is also very flexible in terms of customization and presents unique experiences across different devices. We will change the new project to use a Custom Page that will hold the SplitView control and this page will act as the shell for the whole app giving it a Single Page App like experience. 1. SplitView control (RootSplitView) which has a custom Navigation control (NavMenuList) in its Pane and a Frame (frame) which will hold our Pages. 2. ToggleButton (TogglePaneButton) which will be the Hamburger menu button. 3. Data template for binding items for the custom Navigation Control. 4. Common MediaElement control (mPlayer) that will be used to play the music. We also use some custom style templates which we will add shortly to our project. - Add a new folder named Controls and add a class file in it and name it NavMenuItem.cs . Add the following code to the newly created file. /// Data to represent an item in the nav menu. The above class represents a Menu Item which holds the Item title, Icon and destination page. /// provide the nav menu list with the data to display. /// Navigate to the Page for the selected <paramref name="listViewItem"/>. 1. We create a new List of objects of NavMenuItem class and populate it with required menu options and suitable icons. 2. We also add an Item Invoked event handler to handle click events and navigate to subpages. // suppressing the initial entrance animation. - Add the following code to App.xaml.cs. These variables will hold values that will be used in other pages. If you are new to Sound Cloud API, I would recommend going through the HTTP API Reference on this page (https://developers.soundcloud.com/docs/api/reference). SoundCloud objects (sounds, users etc) can be accessed by using HTTP methods GET, POST, PUT and DELETE and the response is a JSON string. We will be using Json.NET which is a high performance, popular JSON framework to serialize and deserialize Sound Cloud objects from Sound Cloud website and custom Sound Cloud objects in our App. I used the website http://json2csharp.com/ to quickly create classes (and modified for our app) for Sound Cloud objects that we will be adding in our next step. We will use MainPage.xaml as the landing page for our app which will handle login and navigate to subsequent pages. - Add the following code to MainPage.xaml . In the above code we add a ProgressRing control and TextBlock to show the progress. This username is unique and you can get your user name from navigating to your profile page and checking the url for the value. - Once the user id is retrieved, we GET the list of tracks that are liked by you using GetLikes method. - Once the list of tracks are retrieved, we populate the common variable nowPlaying which is a list of SoundCloudTrack objects. - We also navigate to a new page called NowPlaying which we will add in our next step. Add a new Blank Page to our project and name it NowPlaying.xaml. Add the following xaml code to the page. In the code, we add the following controls to build our player user Interface. and two VisualStateTriggers for different widths. These triggers change few properties of controls when the width of the App is changed and this helps us give different experience for different devices without writing any additional C# code. In the above code, once the page is loaded, we start playing the first Track in the nowPlaying list and set the Title, User name and album art based on the Track properties that we fetched from Sound Cloud. Press F5 to debug the app and if there are no compile errors, you should login without errors and our app should start playing the first track from your Likes list in Sound Cloud. Play around with the width of the app or deploy the app on different devices like Tablets and Phone to see how Adaptive Triggers change control appearances based on how you use the app. You will notice that minimizing our app will stop the music and pressing volume controls will not show the default media controls. We will change this behavior and add more features in future articles. With the introduction of new controls and features like Adaptive Triggers, the Universal Windows app experience has improved significantly for Windows 10 in comparison to the Windows 8.1 experience. You now have to build just one Universal Windows app that will run on all Windows 10 devices.